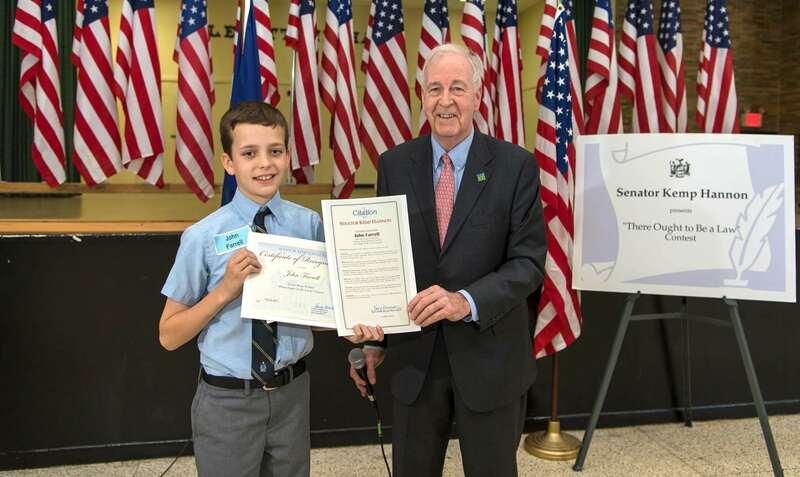 On Thursday, May 24, at the Levittown Hall in Hicksville, sixth-grade finalists were chosen from twenty-five participating schools and honored for their creative and innovative ideas for new laws. The entries touched on topics such as health care, school safety, environmental protection, child safety, and the use of electronics. John Farrell was the winning sixth-grade contestant representing the Brother Joseph C. Fox Latin School. His law stated that Airline Carriers should be equipped with Epi-pens on their flights and have trained personnel to administer them to their passengers should a need become necessary during a flight. John Farrell was also announced as this year’s Grand Prize Winner. At the conclusion of the ceremony, John received two certificates, a gift card, and a personal photograph with Senator Kemp Hannon. Congratulations to John Farrell for his wise contribution and participation in the government which is key to the future of all children and our democracy!